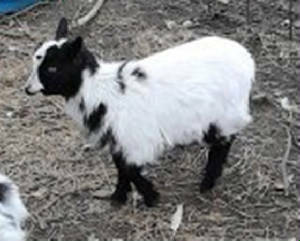 We have a nice variety of registered AGS & ADGA Nigerian Dwarf Goats. There is a nice selection of color and sizes. 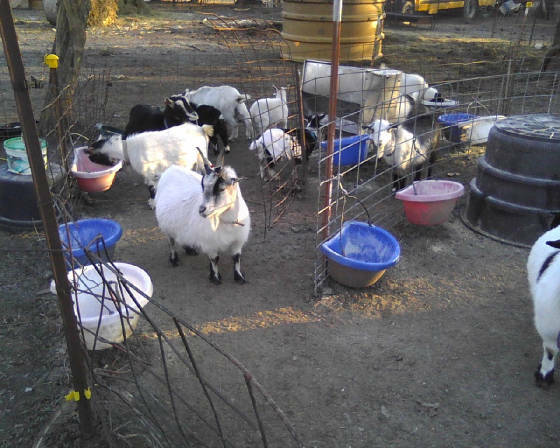 They're in an 80 acre pasture, wormed and vaccinated with Covexin 8 on a regular bases, happy and healthy. You can bottle raise a baby or wait till they're weaned and take them home then. Learn more about them at the bottom of this page. Thanks !!! 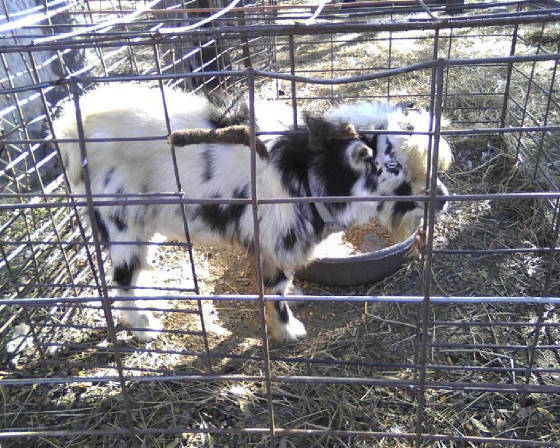 THE CP WALLY is ADGA/AGS registered, Tri-Colored, Blue Eyed, 2014 Buck. He is a nice, small, little boy. Pedals is double registered with AGS & ADGA. She is black and white with blue eyes. She is a great milk producer. 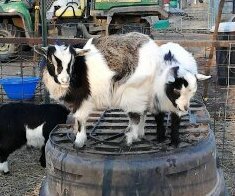 She usually has triplets. 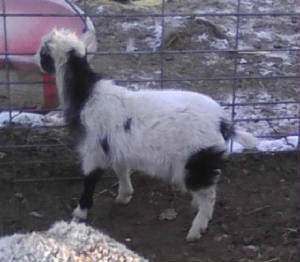 Farrah Fawcett is an AGS, Healthy, disbudded, blue eyed Nigerian Dwarf Doe born March 2011, out of Hoppy Aden's Cinnamon Twister and 4 Boot Ben. She's a red and white nanny. 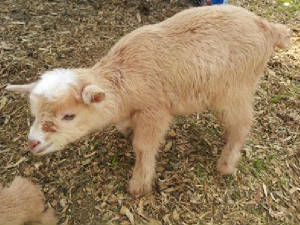 Silky is a Purebred Silkie Fainting Nanny. No registration papers. 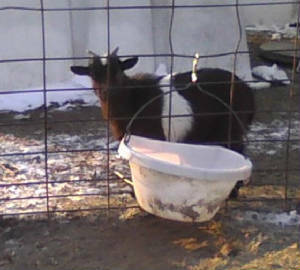 She's a 2008 Black and White Nanny. Very friendly, loves being combed. At this time we are asking $200. 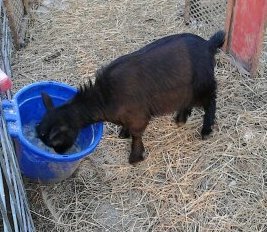 Hedge is a Registered ADGA & AGS Nigerian Dwarf Nanny. 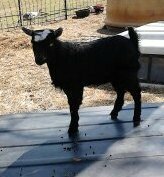 She's a 2013 Dark Buckskin, Polled Nanny. 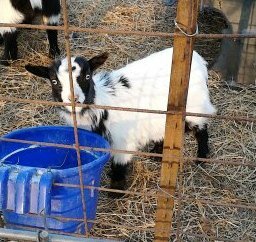 Was bottle raised, loves all the attention you can give her. 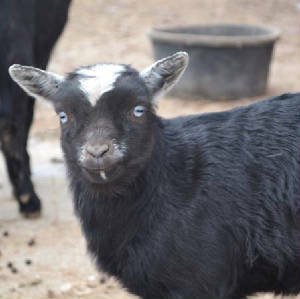 4W Gavrinis Jewels #D-65649 is ADGA/AGS Registered Nigerian Dwarf Nanny. 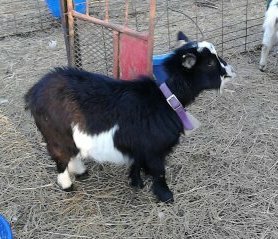 She's a 2011 Broken Chamoisee Nanny. Was a little shy when we first got her, but is one of the first one's to meet you at the gate. 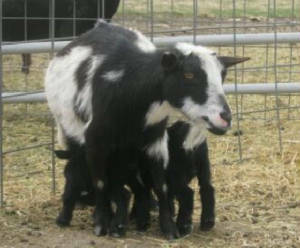 Cordilia is a Registered Mini Nubian Nanny. She is 1/2 Nubian and 1/2 Nigerian. 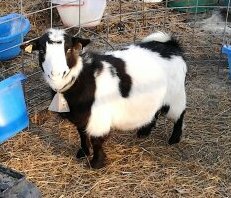 She's a 2013 Dark Mahogony Bay w/ Frosted ears, & muzzle. She also has blue eyes. Persimons is an 2013 cream Nigerian Nanny. Blue eyes and disbuded, very friendly. 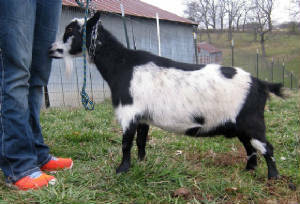 Aurora is a 2010 Purebred Nigerian Nanny. No registration papers. She doesn't have blue eyes, but produces blue eyed babies. 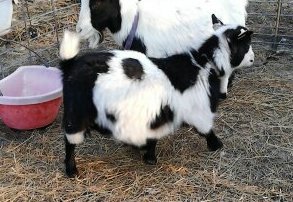 She is black and white spotted. One of Tarzan's Daughter's. 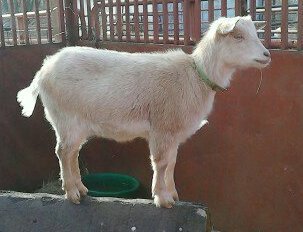 Mallo is an 2012 Purebred Nigerian Nanny. No registration papers. She is a spotted black and white nanny. She doesn't have blue eyes. A daughter of Tarzan. 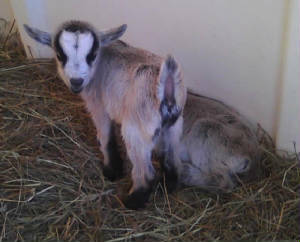 West is a 2013 Purebred Nigerian Nanny. No registration papers. She has blue eyes. 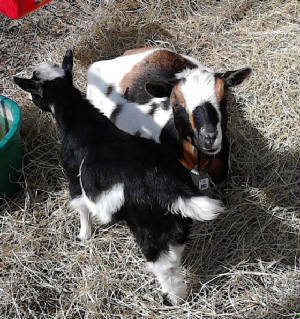 She is a tri-color nanny. Her father is Tarzan. At this time we're asking $150. 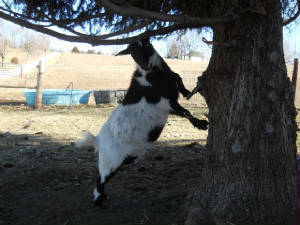 She is bred for spring babies. 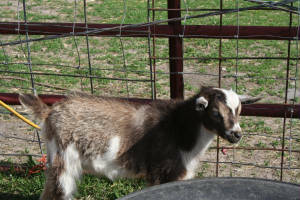 Mint is a 2013 Purebred Nigerian Nanny. No papers. She doesn't have blue eyes. She is a solid black nanny. Her father is Tarzan. 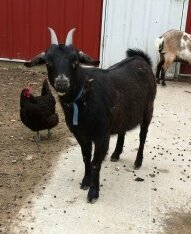 Bliss is a 2013 Purebred Nigerian Nanny. No papers. She doesn't have blue eyes, but her sister Blue does. 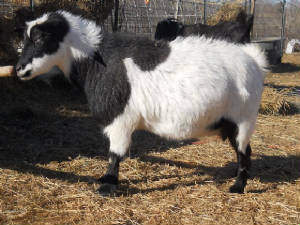 She is a spotted black and white nanny. Her father is Tarzan. 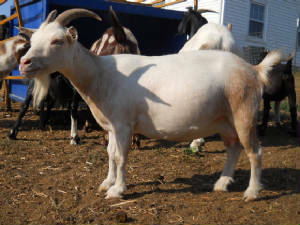 Blue is a 2013 Purebred Nigerian Nanny. No registration papers. She has blue eyes, but her sister Bliss doesn't. 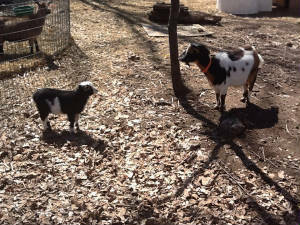 She is a spotted black and white nanny. Her father is Tarzan. Nigerian Nanny with Blue eyes. 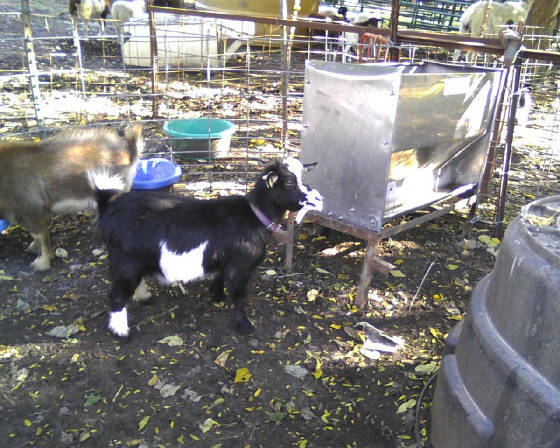 Pansy is an 2014 Purebred Nigerian Nanny. No registration papers. She is black, with frosted ears, blue eyes and a big star on her head. 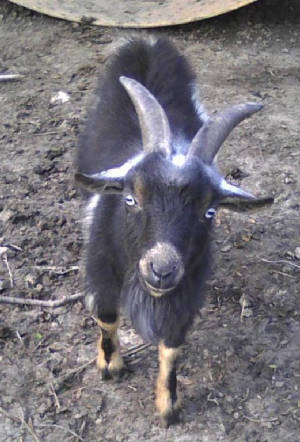 Nigerian Buck with Blue Eyes. 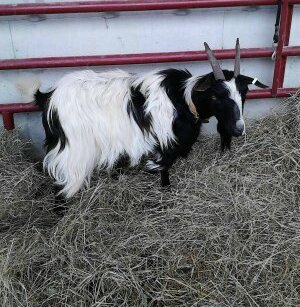 OUR NIGERIAN BILLY, W/BLUE EYES. 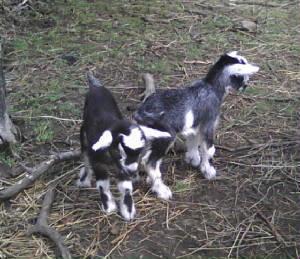 African Pygmy Goats were originally developed to be a small meat goat but they have gained popularity as backyard pets. 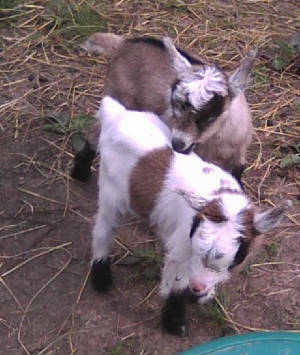 The Pygmy is small, cobby, compact & muscular goat. Their legs and neck are short in relation to body length. The body size is proportionally larger in relation to the height and weight when compared to that of other breeds. 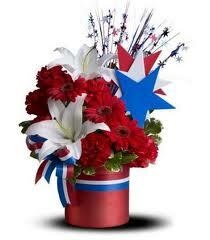 The broad head is large in proportion to body size." 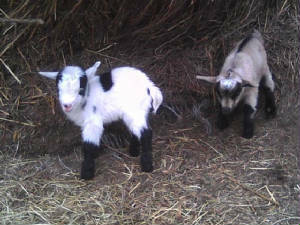 Pygmy goats are very simliar in height to that of the Nigerian Dwarf. 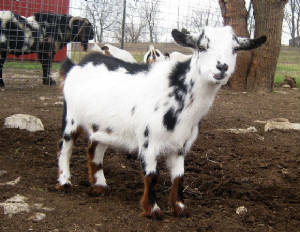 Average height of African Pygmy goats is 16" to 21". 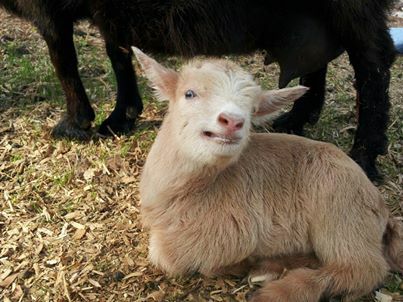 In breed standard Does are allowed up to 22.5" while bucks are allowed up to 23.5". 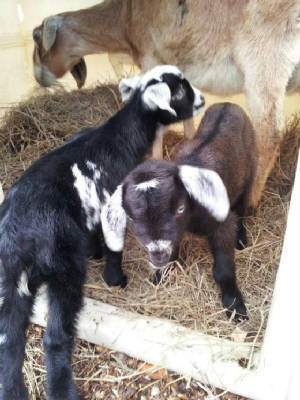 Pygmy goats come in only a few colors! Caramel, Grey Agouti, Brown Agouti, Black Agouti, Solid Black or Patterned Black. 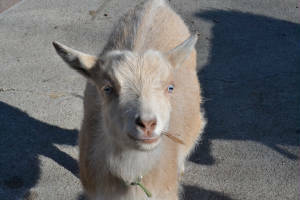 Pygmy goats DO NOT have blue eyes. 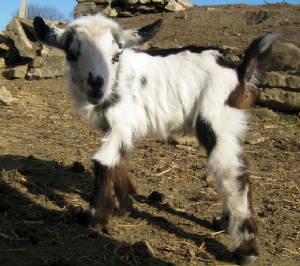 Any blue eyed "pygmy" goat has Nigerian Dwarf in it's ancestry. Blue eyes would be a disqualification in the show ring. 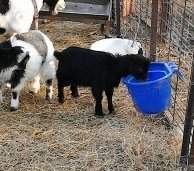 Nigerian Dwarf goats are considered a dairy goat but they are also popular backyard pets. 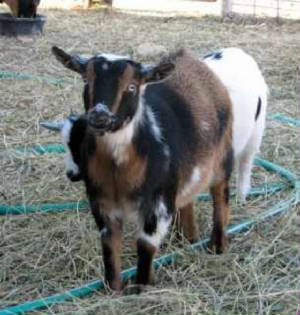 The Nigerian Dwarf is a miniature dairy goat. 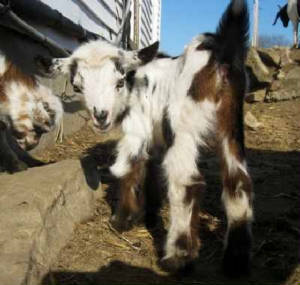 They should be balanced in proportions giving it an appearance similar to the larger breeds of dairy goats. 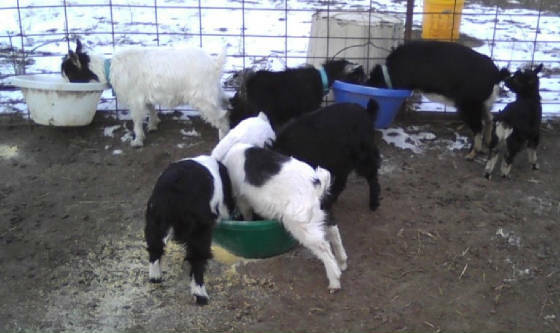 Dairy goats have longer necks and longer legs. They are known for their high quality milk with a high butterfat content. 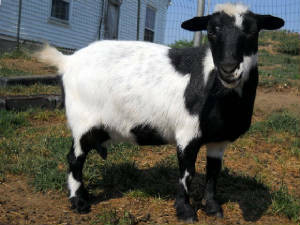 Nigerian Dwarf goats are very simliar in height to the African Pygmy. 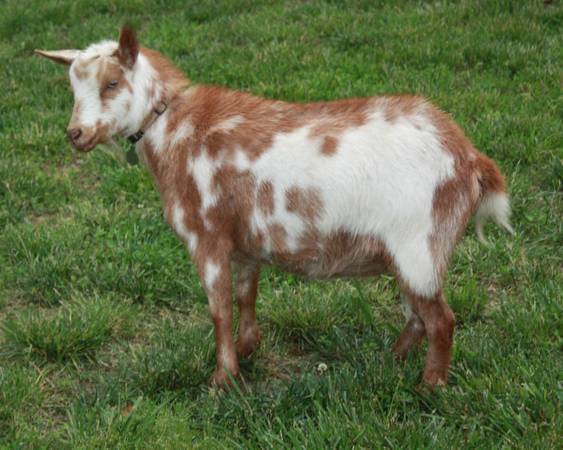 The average height of Nigerian Dwarf goats is 17" to 21". 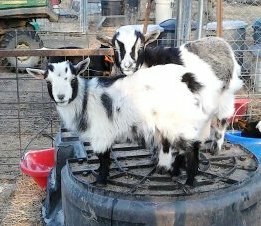 In breed standard Does are allowed up to 22" while bucks are allowed up to 23". 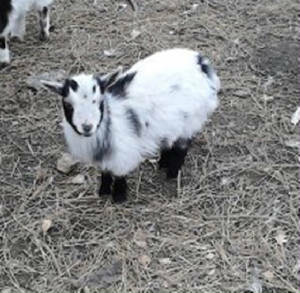 Dwarf goats come in a very large variety of colors & patterns. Some examples are: Gold, Cream, White, Black, Chocolate, Chamoisee, Buckskin, Swiss Marked, Cou Blanc, Cou Clair, Sundgau & any combination of these colors.